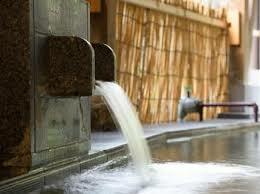 In Japan, there is a law called “hot spring law” established for hot springs to regulate the quality. Groundwater may contain ingredients harmful to the human body, therefore, an analysis of the water must be conducted by a professional before it can be used by the public. 1: The temperature when taken underground is 25 ° C or higher. 2: One or more of the 19 specified components has reached the specified value. However, if it meets the condition of #2 even if it is below 25 ° C, it can be classified as a “cold hot spring”. Also, if conditions are met, water vapor or gas can also be hot springs. 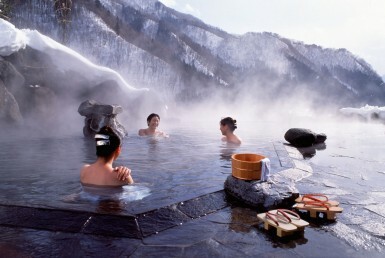 The temperature of hot springs is classified into 4 categories. It is classified into 5 categories. Low pH value is “acidic” while a high value is “alkaline/basic”. Acidic hot water has sterilizing abilities and has the effect of removing old, hard skin. Alkaline hot water can be compared to soap, removing oils and dirt off of skin. Weak-acidic to neutral hot water is similar to human skin, so it has fewer stimuli and is the safest for sensitive skin. Spring quality is classified into 10 types. In hot springs, there are individual characteristics such as ingredients, temperature, pH value, color, smell, taste, touch, etc. Simple: A low ingredient, mild hot water good for children or elderly people. Among these, alkaline springs with 8.5 pH + are included. Chloride Fountain: Salt is the main ingredient, which adheres to the skin while bathing and prevents drying and the evaporation of sweat. It is characterized by being well-warmed. It is recommended for people with dry skin or people who have trouble warming up. Hydrogen Carbonate Fountain: Because of the high sodium-bicarbonate content, these springs act like soap and removes rough skin and pore stains on the skin. 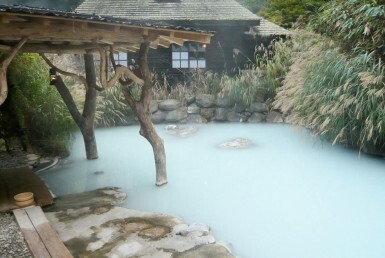 It is also known as “beautiful skin hot spring” as it removes dirt. People with dry skin tend to need moisturizer after getting out of the baths. Drinking this water can help improve diseases such as diabetes and liver diseases. Sulfate Fountain: Called “scratchy hot water” because it helps cuts, burns, skin diseases, etc. There is also a sedative effect and a blood pressure lowering effect with this type of spring. Depending on the ingredients, it is classified into “sodium sulfate spring”, “calcium sulfate spring” or “magnesium sulfate spring”. It coats and moistens the skin. Carbon Dioxide Fountain: These springs are characterized by carbonic bubbles adhering to the body while bathing. Carbon dioxide vaporizes when warmed, making it more important than temperature. Blood circulation greatly improves in these baths, and can even warm the body in low-temp springs. You can help heal a sore throat by drinking this, and can even help anorexia or constipation! Iron Fountain: When iron oxidizes, it changes to brown when exposed to air. Iron warms the body from the core to convey heat, removes shoulder stiffness, and aids cold bodies and menstrual disorders. It is especially recommended for women because it helps anemia when drinking. Iodine Fountain: Iodine has a strong oxidizing power and is antibacterial, often used in mouthwashes and disinfectants. It can be bitter when drunk but can improve hypercholesterolemia. Acidic Fountain: Characterized by low pH values and high acidic contents. It has strong sterilizing powers and is used for the treatment of athlete’s foot and chronic skin diseases. It peels/melts the surface of the skin, and since it can be a little irritable, it is not necessary to wash with soap before entering. Metals may discolor so they should be removed before entering. Radioactive Fountain: A radon-containing hot spring containing a certain amount of radon. Radioactivity is thought to have an adverse effect on the human body, but very little radioactivity has been demonstrated have a positive effect on the body. By bathing, gouts, chronic gall bladder diseases and cholelithiasis are aided. Inhaling small amounts of radiation emitted from the hot springs can improve your immune system and the balance in your autonomic nerves. Sulfur Fountain: Smells like a rotten boiled egg at times, it is the most iconic type of hot spring. It is said to be effective against all types of diseases since ancient times. When it comes int contact with air, it turns cloudy or yellowish color, and a precipitate called “yunoha” can be formed. Sulfur fountains oxidize metal such as silver, so accessories should be removed before entering. 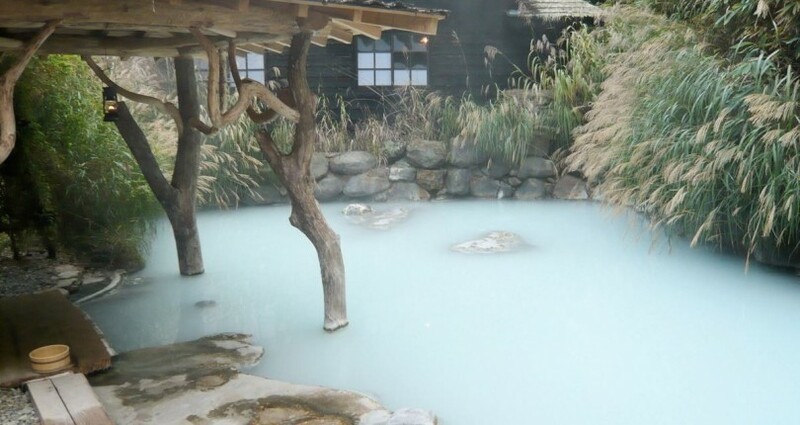 Other Springs: Although it isn’t a classified spring, some hot springs may contain “metasilicic acid”, a natural moisturizing ingredient that improves the ceramide (waxy lipids) on the skin. This coats the skin, making it feel ”slippery”, a prized quality in many springs for its beauty effects. *100% perfectly sourced water refers to a hot spring that is directly sourced, no additional warming, additives, chlorine, disinfectants, etc. 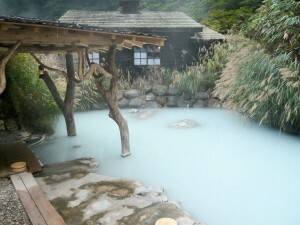 The effect of hot springs is not limited to each own’s quality and ingredients. By combining various conditions, the effects are almost limitless. Neuralgia, muscle pain, arthralgia, stiff shoulders, motor paralysis, joint stiffness, burning, hemorrhoids, coldness, period recovery, fatigue, chronic gastrointestinal disease, health promotion. 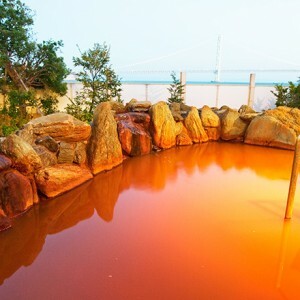 Warming your body in hot springs improves blood circulation and muscle tension, which in turn help nervous tension. When immersed in water, the hydraulic pressure is applied to the body. It has a massage effect, aids in blood circulation and lymph nodes. Metabolism improves, waste excretion is also encouraged to that fatigue recovery improves. When buoyancy releases the muscles and joints that normally support your weight from gravity, your mind and body relax. As your body gets lighter, your limbs become easier tome, helping rehabilitation. Leaving the daily grind and putting yourself in a different environment can have various mental and physical effects. Especially when in natural environments, your brain, respiratory system, digestive organs etc. can receive good effects from hormones and autonomic nerves.